Eileen Boyle, MSW, authored an article in the August issue of RBT+ (a digital magazine published by RenalBusiness.com) about keeping patients in their prescribed treatment for the entire duration. The point is that all too often patients don’t stay for the full treatment and leave early. When they do that, it requires the patient to sign a form popularly called the AMA (Against Medical Advice) to protect the center and staff from liability. The article, titled, “A Patient-Centered Approach to Addressing Non-Adherence to Treatment” talks about the most frequent issue that’s raised with the ESRD Network: Non-Adherence to Treatment. 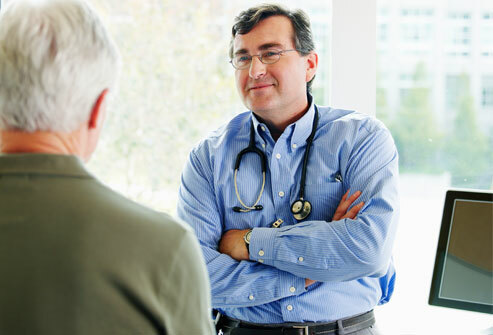 “This non-adherence can range anywhere from refusal to take medications, poor diet and fluid restrictions, refusal to draw labs, or poor treatment attendance.” The predicament is that the staff know the importance of completing the treatment, taking proper meds, maintaining a good diet, restricting fluid and having good labs but they are frustrated by the fact that the patient has the right to refuse any or all of this advice. The article offers great practical advice on how the staff can handle these situations. Another article addressing how the staff can handle this situation is at the ESRD Network of Texas website, titled: “Dealing with the Non-Compliant DialysisPatient” and offers 10 steps to achieving compliance. I want to review this issue from the patient perspective. Like the staff, I see the value of all they are doing for the benefit of the patient and I respect the patient’s right to refuse anything they don’t want. However, as another patient, I can speak plainly about the repercussions of refusing treatment and that’s this purpose of this article. It’s also a personal issue because of recent tragic events that I’ll mention later. I’ve written about fluid restrictions and controlling fluid intake in “Dialysis and Fluid Control“. Putting a lot of fluid into your system when it has no where to go because your kidneys have failed is counter-productive. You can get away with a infrequent events of excess fluid but on a continual basis it does a huge amount of damage to your heart as shown in this poster from the ESRD Network of Texas. And, I’m not talking about going a 1/2 kilo over your usual incoming weight to dialysis. I’m talking about coming in with 6, 7, 8 or more kilos of fluid! And I’ve seen this. I’ve seen patients coming into the center so swollen with fluid their faces are enlarged! You can imagine what their cells look like and their heart trying to pump under all that fluid pressure. We all have medications we’re supposed to take and I’ve written about the side effects those may have such as diarrhea, constipation, and other digestive issues in “Dialysis and Diarrhea“. There are lots of foods we simply can’t eat because they elevate the levels of chemicals that can’t be removed or controlled by dialysis. The two chemicals we have to watch most are Potassium and Phosphorus. I’ve written about “Dialysis and Phosphorus Control” and plan to write about Potassium Control in the future. But the one thing I want to stress with this posting is non-adherence to the dialysis treatment. I’m not perfect in this matter. I’ve signed the AMA form a few times for various reasons but I see patients all too often who get a bit uncomfortable and leave an hour or more short of the dialysis treatment. There’s one particular patient who would do that almost every treatment. She would come into dialysis with her face swollen, shuffling because her feet were painfully swollen, and in obvious discomfort, When she would control her fluid and stay for the full treatment, she was a completely different person. I barely recognized her a couple times because she looked in such good shape. However, she pushed it too far, too often and suddenly she didn’t come into the center anymore. I asked about her and she’d passed away. Her heart simply gave out under all the pressure and she left her children motherless. I miss her dearly for the conversations we’d have when she was in good form. But she couldn’t grasp the importance of following the doctor’s, nurses’, technicians’ and nutritionist’s advice. Lately another acquaintance of mine in the center “disappeared”. He’s another that would come in with several kilos of fluid above his reasonable levels and he was notorious for self-medicating himself. There was a woman patient who would admonish him any time he wanted to leave early from treatment. She would cajole and threaten him and get him to finish his treatment but she got a transplant and isn’t around anymore for him. I was friends with him and we often saw each other outside the center so over the past couple years, we had something like a friendship but lately we were on different shifts so I couldn’t be there to insist he complete the treatment. Like the others that push the envelope, his body gave out after repeated stress of accumulated fluid and abuse. When I’ve signed out AMA, it was because the conditions in the “Center from Hell” would get me so angry that, combined with the general discomfort of dialysis, I couldn’t take it anymore. But I’m not talking about leaving 1 or 2 hours early; my leaving was 15-30 minutes early. However, even doing that too often means you’re leaving with toxins and fluid in your blood that will wear you down and make it that much more difficult for the next treatment. Having a good, thorough cleaning and fluid removal is important as is keeping yourself in the shape. Lately, I’ve been adding another 15 minutes to my treatment to allow my body a little longer time to remove fluid and toxins. That little bit extra means I leave dialysis with very little discomfort and cramping is a almost a thing of the past. I figure, I’m there, got needles stuck in me, and so why not? I leave much more comfortable and with a little spring in my step. I feel much better and recover more quickly in the post-dialysis period. 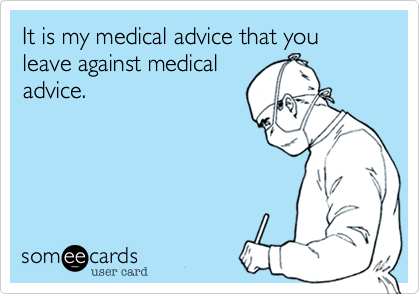 On the lighter side, I found this card from Someecards that makes fun of the situation of signing out Against Medical Advice. However, leaving treatment early is a serious topic and could be lethal if done too much and too often. I hope you understand my reasons for writing about this. Two people I’ve known have left this life and it was perfectly preventable if they adhered to the treatment and took control of their lives. This entry was posted in cramping, cramps, dialysis, dry weight, fluid control, New Patient, Patient-Centered Care and tagged Against Medical Advice, AMA, cramping, dialysis, education, ESRD, patient-centered care, treatment. Bookmark the permalink.